Posted on April 16, 2013 at 11:20. At Hope Industrial Systems we recognize the important role safety and performance play in our ability to deliver the high quality products our customers expect. As an extra step in quality assurance to ensure our products adhere both to the standards we assert and to the quality our customers deserve, we’ve adopted International Electrotechnical Commission (IEC) standards for the testing of several of our key products. Update Sept. 2018 – since this article was published, we have received IEC ratings on many more products. Please visit our IEC page for full details. The IEC is the leading organization in the preparation and publication of international standards for devices that contain electronics and use or produce electricity worldwide. All IEC standards are consensus-based and represent the needs of every country participating in the development of the standards, which involves the participation of more than 10,000 government, industry, research, academic and consumer experts around the world. The IEC ensures millions of electronic, electrical, and related devices perform well, fit together, and operate safely. It not only establishes international standards, but also publishes conformity assessments by which adherence to the standards is tested. 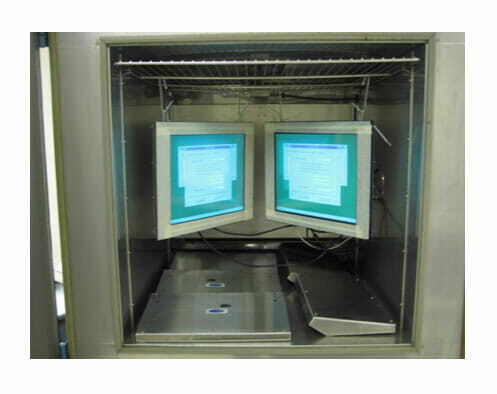 Our 15″, 17″, 19″ (except for RL19), 20″, and 22″ monitors are tested to confirm that during storage, operation and transportation within industrial settings, they can safely withstand exposure to liquids, heat, shock, vibration, and humidity. We begin the testing by utilizing an IEC classification system to determine to which environmental conditions a Hope Industrial Systems product could be exposed, given its intended mode of operation, storage, and transport. Next, IEC guidelines determine which tests we will use to simulate these environments in the lab. The monitor then undergoes all the tests required to qualify for the environmental rating under which it’s been classified. It must pass all the prescribed tests to meet the IEC standards. Criteria for passing the test are that the monitor must remain operational throughout the test and must show no visual signs of material degradation after the test is completed. Temperature-related tests confirm Hope Industrial Systems monitors can withstand non-operational temperatures as low as -25°C during transport and -5°C while stored. We test that a monitor can be operational in -5°C. Heat tests verify that a product can be stored or transported in temperatures up to 55°C and operational at temperatures up to 45°C with a ten degree increase due to thermal radiation, solar radiation and movement of air. Thermal shock tests confirm that a monitor can withstand a rapidly varying temperature of -25°C to ambient during transport, and -5°C to ambient during operation. Monitors are also tested for their ability to withstand high-humidity conditions during operation, transport and storage and high humidity combined with moderate changes in temperature that could produce condensation during storage and operation. We perform mechanical shock tests to demonstrate that our products can be subjected to moderate shock as defined by IEC standards during operation and transport. In addition, monitors are tested to verify that during transport and storage they can withstand rough handling that could involve dropping, as defined by IEC standards. Lastly, we perform tests to demonstrate that our packaged monitors can withstand static loads that are potentially imposed during transport or storage when items are stacked on top of it and for a monitor’s ability to withstand moderate vibration during operation, storage, and transport. Learn more about our IEC Reliability Standards.